Bingo Bango Boom Fruit Machine Guide & Review - Casino Answers! 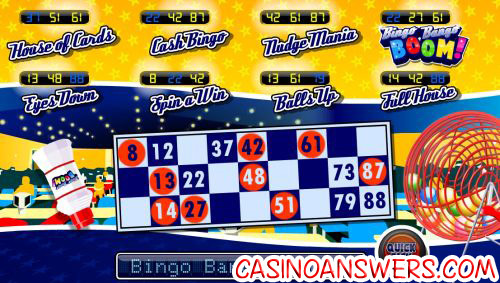 Bingo Bango Boom is a 3-reel, 1-line fruit machine developed by Microgaming with many bonus games and fruit machine features. You can play the Bingo Bango Boom fruit machine at All Slots Casino and Lucky Emperor Casino. Unlike many fruit machines and pub slots such as the Billion Dollar Gran Pub Slot, the Bingo Bango Boom regular slot game does pay out for winning combinations rather than a Win Spins bonus game. Symbols include Cherries, Lemons, Oranges, Single Bar symbols, Plums, Double Bar symbols, 7’s, Watermelons and the Bingo Bango Boom jackpot symbol. Bingo Bango Boom is very bright and colourful, using mostly yellow and blue as its colour scheme, but as you can see below, not limiting itself to that. Bet amounts on the Bingo Bango Boom slot machine are $0.10, $0.20, $0.25, $0.50, $1, $2, $5 and $10. Select your bet by using the “+” and “-” buttons. There are coins or paylines to select, as it is a one payline reel slot machine, so all that’s left to do once you select your bet per spin on Bingo Bango Boom is hit the “Spin” button. The top jackpot on the regular slot game of the Bingo Bango Boom pub slot is the Bingo Bango Boom symbol. 3 Bingo Bango Boom symbols on the win line (or payline) will pay out 500X your bet. If you bet $10 per spin on Bingo Bango Boom, you can win up to $5,000 on the regular slot game alone at All Slots Casino. During the regular slot game, various symbols will randomly have numbers next to them. The numbers on the reels will be added up and put towards the Bingo Ball Number Trail. If you hit the number 8, you will enter the Bingo Bango Boom bonus game. You will retain your spot on the trail if the “Trail Held” sign lights up. Many of the symbols in Bingo Bango Boom are randomly labelled as Bonus symbols. When this happens, the four reel bonus games will flash on the display. Use the “Stop” button to select one of the four. Boost will boost your position randomly on the Bingo Ball Number Trail. Skillshot will move along the Bingo Ball Number Trail in a sequential manner, so you can time when to hit “Stop.” Your goal will be to stop on the eighth ball. Selector is like Skillshot, but selects groups of balls randomly. Stoppa will randomly flash numbers in no sequential order, which can be hard to predict. When the Bingo Ball Number Trail reaches 8, you will trigger the Bingo Bango Boom bonus game. The bonus game is a game a bingo where each of the various bonus features will have 3 numbers. The first to 3 will be the bonus feature that will play. Press the “Quick Pick” button to jump to the end of the bingo bonus game. Within the Bingo Bango Boom bonus game, you can win up to 3000X your bet. There are eight different bonus features that you can activate in the Bingo Bango Boom bonus game. Nudge Mania allows you to win up to 15 nudges. We at Casino Answers recommend gambling your nudges, as you will win nudges either way. With Cash Bingo, you can win a cash prize based on the bingo number drawn. In Full House, you can deice where to stop on a group of three numbers to win the accumulated value of those numbers. House of Cards allows you to stop the reels on one of the symbols in the regular slot game to win its payout. Eyes Down is another bonus feature that takes place in the regular slot game. Balls Up gives you the chance to collect a prize based on the balls in the bingo game. Spin a Win will earn you an automatic winning combination. Lastly, Bingo Bango Boom is a random win feature where you can win up to 3000X your bet. One of the features fruit machine players have come to expect on fruit machines is the nudge feature. This allows the player to bump the reel down one position, to potentially create new winning combinations or move further down the Trail. Use the arrows ontop of the reels to view the two positions above each reel. Like on any fruit machine we have played, the nudge feature is random on Bingo Bango Boom. You can win up to 15 nudges in Bingo Bango Boom, which you can Bank (save) and gain Extra Interest (earn more) on. 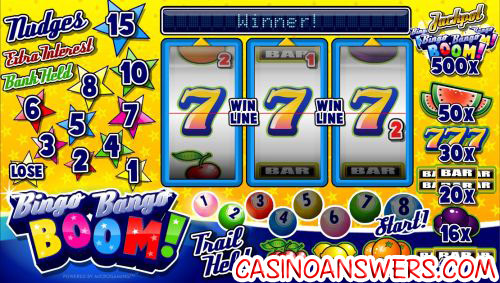 Another fruit machine feature that you will find on Bingo Bango Boom is the hold feature. Like nudges, the hold feature is random. It allows you to hold as many reels as you like in the same position for the following spin. Hit the “Cancel” button to reset which reels are selected. Holding is not as frequent in Bingo Bango Boom as other pub slot games. Bingo Bango Boom also has the Shifta feature, which will spin the reels into an automatic winning combination. Bingo Bango Boom is an amazing fruit machine that you must experience to fully gain an understanding of. There are so many different features and possibilities that it is impossible to know exactly what you are getting simply by reading this review. If Bingo Bango Boom is not the best Microgaming fruit machine, it is definitely up there. You owe it to yourself to try it out now at All Slots Casino! Are US players able to play Bingo Bango Boom for real money? Unfortunately, players from the United States are not able to play the fruit machines at Microgaming online casinos for real money. For a video slot with a bingo bonus game, please read our Baby Boomers: Cash Cruise iSlot Review or play it at the US-friendly Vegas Days Casino. Where can I play a Flash game of Bingo Bango Boom for free? You can use the No-Download Instant Play features at All Slots Flash Casino and Lucky Emperor Flash Casino to play a Flash version of the Bingo Bango Boom slot game for free or real money. If you experience any issues with the Flash software, make sure you have the latest version of Adobe Flash Player installed on your computer. A fruit machine is a type of slot machine often found in pubs in the United Kingdom. These pub slots are more skill-based than your average slot machine found elsewhere due to some of their features such as nudging and holding as well as stopping. These features require more sense and timing, rather than simply good luck. For more fruit machine reviews, feel free to read our Billion Dollar Gran Fruit Machine Review, Cops And Robbers Fruit Machine Review, Deep Sea Dosh Fruit Machine Review, Fire-N-Dice Fruit Machine Review and Pub Fruity Fruit Machine Review. How much can I win playing the Bingo Bango Boom fruit machine? You can win as much as 3000X your bet playing Bingo Bango Boom! If you bet $10 per spin, that means you can win up to $30,000. Where can I play the Bingo Bango Boom Fruit Machine Flash Game?